> As a color pie guru, I hate Hornet Sting with a burning fury. I tried to get the card moved to white but failed. > Stopping green creature kill is a losing battle I’ve been fighting for 15 years. Slippery slope started with Dessert Twister in 5th. > @misterorange Magic would not be the game it is if one color just let you do everything. > @surmem I’m all for bending rules but there are some more dangerous to bend than others. Once you can do something you no longer can’t. > @EdGuise88 There is no such thing as a popular one-of in Magic. If people like it, there will be pressure to do it again someday. But is this the end of the colour pie as we know it? A seismic realignment? Or the stirrings of evolution of the game? In other words, this isn’t exactly new ground. By the time Mirage rolled around in 1996, the game had matured significantly in just a few short years with a more ‘modern’ notion of balance (by contrast, the dreadfully-balanced Legends set was released in 1994). In both cases, Green is getting access to something a bit outside its purview, and -here’s where the balancing act comes in- is paying mightily for the privilege. Four mana for two damage at Sorcery speed was never a bargian, and when you have Lightning Bolt to compare it to, one mana for one damage as an Instant is no great shakes, either. Still, being that it helps Green deal with one of its glaring weaknesses (utility creatures, for instance a Cunning Sparkmage with a Basilisk Collar), in some circumstances the cost will be gladly paid. The second argument in favour of Hornet Sting, after precedent, is flavour, and this case is far weaker. The simple truth is, you can take almost any effect, wrap it in a “nature” theme, bake it and call it Green- that doesn’t necessarily mean it should be. It’s not difficult to envision a storm so ferocious it sends farmers, soldiers and even beasts of the wood into hiding to ride it out… but “taps target creatures. These creatures do not untap during their controller’s next untap phase” effects are rather solidly Blue. So precedent wins out, but what about the longer-term effects on the game? Reading MaRo’s tweets, its hard not to escape a certain “Chicken Little” feeling of impending doom closing in… rabid developers ready to shovel in cards the players clamour for, colour pie be damned, and with only MaRo standing between them and preservation of the game as its come to be. But with respect to Mr Rosewater, I think that expectations of doom are perhaps a bit overstated. 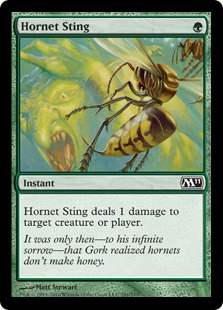 Hornet Sting came out of nowhere- there was no sizable “Green lobby” demanding an upgraded Unyaro Bee Sting that Wizards caved into. And the mechanisms are in place to where it will, in time, fade from the scene if permitted to (in other words, if it doesn’t work, or nobody plays it). That’s one of the great apects of the annual Core Set release structure- Wizards is now able to have its fingers more closely on the pulse of the game, and has greater flexibility and freedom to try the occasional off-spell like Hornet Sting. After all, there’s no guarantee it will be back in M12. Player demand is listened to, but hardly the voice of the almighty for Wizards- otherwise Lightning Bolt would never leave Standard, and the Counterspell of old would be back. And if indeed there is a paresence within Wizards wanting creature removal in Green, and MaRo’s been able to hold them in check but for the occasional slip-through, then I might just call that “working as intended.” It’s silly to think that all the great minds behind the game are in accord on everything, and the creative tension in their offices probably makes for a better game today. So let’s just enjoy this for what it is, and appreciate the thought behind it. It’s not the end of the colour pie, no matter how ‘forced’ it might feel. It certainly has its drawbacks- it’s inefficient, for one, and asking Green mages to devote an entire card to do a single point of damage is asking more than you might think. But if Wizards occasionally takes chances and mixes things up a little bit on a tinkerer’s scale (as seperate from a design element like Time Spiral block), have fun with it. In a time when the prices of individual cards seem to be spiraling ever-upward, having a Common answer to a Mythic Rare is itself a victory of sorts! I remembered Unyaro Bee Sting. And Unyaro Bees, from Time Spiral. I always loved screaming “BEEES!” Invader Zim style whenever I dropped the Unyaro Bees, terrible as they are.